Man, James Rice is all over these Sunday installments. Is it time for Matrix nostalgia yet? Will it ever be time for Matrix nostalgia? I would say no, but supposedly there’s Tron nostalgia going around, so anything’s possible. I was going to post new bonus Sunday stuff today, but my computer totally crashed on Thursday night and I can’t get to my fan art and stuff. I’m writing this from my laptop at the coffee shop up the street. I am going to get so fat on hot chocolates until my desktop is fixed. The background text in this image wasn’t exactly random. It was taken from some E-mails from Shaenon, but each character was changed. I think we were discussing toothpicks. 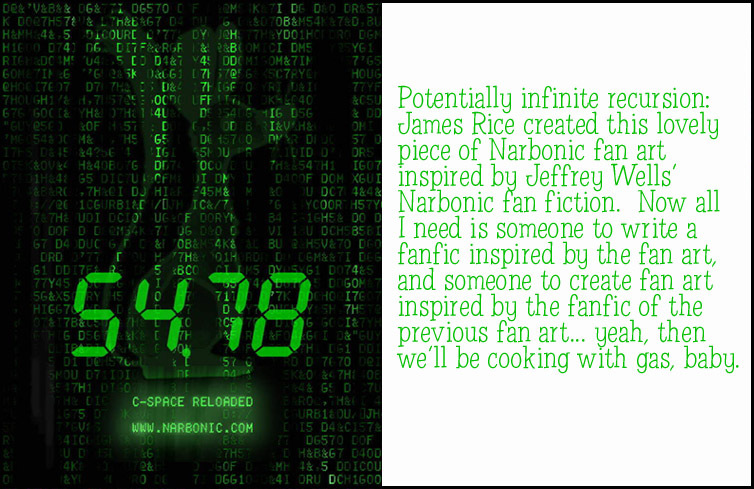 All true fans of Narbonic should know the two meanings of 5478. I think this was the fastest an funnest of the Narbonic movie posters I did. What a great … historic date! Five / four / seven-eight! It’s the “RT” test that Helen loves best! Feasts on cake and wine! Get them straight! There’s no debate! See the digits four that we all adore! Er… Suppose I missed the meaning of 5478? Where would I find more about it? Well, us forum-ites have created fanfic inspired by the comic, and there’s been fanart created of that… could work! * Distance in metres from Dave’s apartment to the lab’s highway median strip entrance. * Dave’s ‘Dig Dug’ high score divided by 10. * Total amount of bullets fired by Mell throughout the whole series. * Total amount of dollars Dave spends on cigarettes throughout the whole foliation of time in which he buys cigarettes. * Last 4 digits of Foxy Cop’s phone number. * First 4 digits of Dr. Narbon’s phone number. * Number of minutes Mell spends dead and in Heaven (OH UM SPOILERS). Query: what is the ‘Narbonic Sunday font’ used in this and other episodes? Artie’s original “name” was RT-5478, presumably a serial number. In the Director’s Cut, Shaenon told us that she chose that number because her birthdate is 5-4-78. So It Begins: Alas, the elusive triple recursion eludes us.James, thank you so much for making this fanart of my fanart.